#1 Biggest Interview Mistake, Top 25 Interview Questions/How to Answer and more - All In 10 Steps That Will Get You the Job Offer. 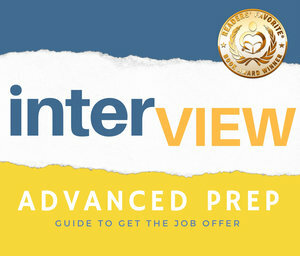 Industry-leading guidance typically retained for top executives on how to prepare, research, strategize and win your interview. 10 Rookie mistakes, 25 top questions, salary, HR secrets, dress code, how to stand out & more. Written for college grads. Written by Executive Headhunter, Search Firm Owner and Personal Interview Prep Founder Matthew Sorensen. Both 5-Star rated sources will prepare you better than any resource available.